It’s a familiar sight. But now it’s re-emerged for an even more exciting reason. Josh Duffee, drummer and bandleader who loves the hot / dance music of this period, especially admires drummer multi-instrumentalist Chauncey Morehouse. And rightly so. Josh’s dreams are substantial, and he energetically makes them take shape. 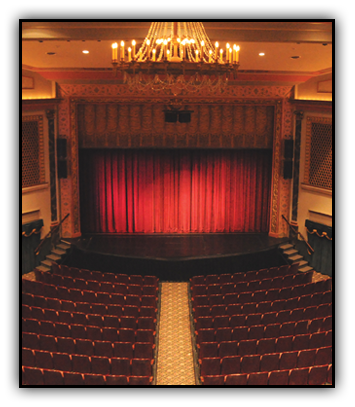 His newest venture will please up to 800 people on the evening of Wednesday, July 22, 2015, at the Capitol Theater in Chambersburg, Pennsylvania. 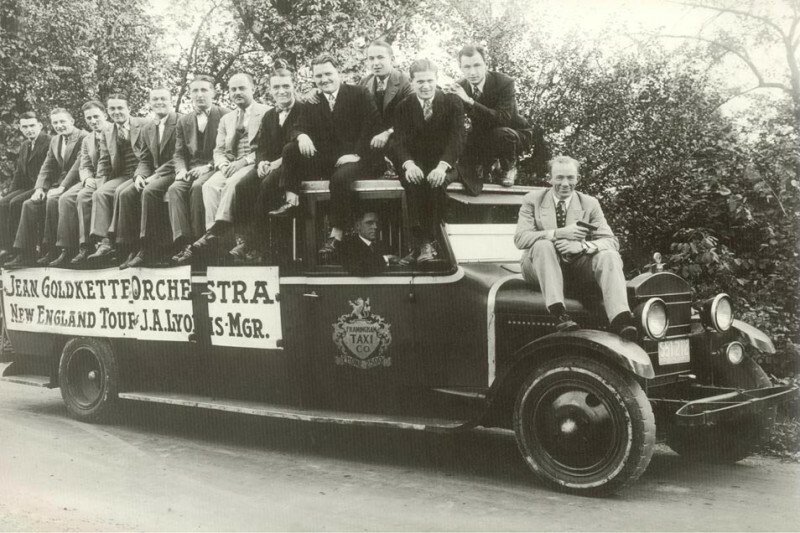 Chambersburg isn’t one of the most famous stops on the Official Jazz History tour, but it was the home town of Chauncey and of Jean Goldkette trumpeter Fuzzy Farrar. 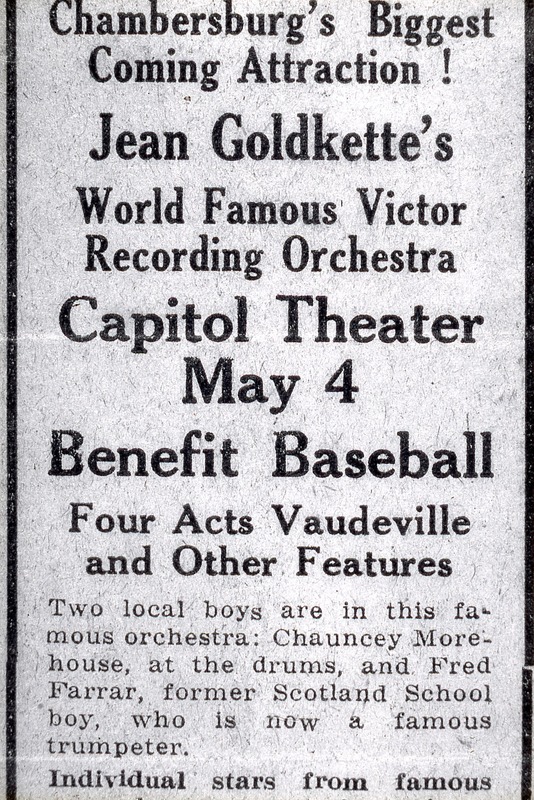 In 1927, the Goldkette orchestra played a concert in this beautiful theatre; on July 22, a reconstituted tentet of some of the finest hot musicians worldwide will honor Chauncey and his music. And it’s free. You can find out much more about the concert here and, should you be so inclined, you can make a donation to cover the expenses. I asked Josh for more details about the music and the musicians. First off, this ten-piece band will be primarily made up of the brilliant Hot Jazz Alliance, a sextet that is four-sixths Australian and two-sixths North American and six-sixths brilliant: From Oz, Michael McQuaid, reeds; Jason Downes, reeds; John Scurry, banjo / guitar; Leigh Barker, string bass. From the US: Andy Schumm, cornet; Josh Duffee, drums. Joining them for this concert will be Jay Rattman, reeds; Mike Davis, trumpet; David Sager, trombone; Tom Roberts, piano. The second performance is particularly significant because it comes from the HJA’s debut CD — which is now issued, in gorgeous sound, ready for the eager multitudes. But back to the Capitol Theatre concert. I don’t like being in the car for more than ninety minutes at a time, but I’m driving out to Chambersburg for this one. And two days earlier / closer to home in New York City, the Hot Jazz Alliance will be performing two shows on Monday, July 20, at Dizzy’s Club Coca Cola in Jazz at Lincoln Center: details here. As I write these words, it is ninety degrees and humid both inside and out. But even more Hot — of the best sort — is coming. Clint is so good on so many instruments that his strong, focused bass playing might be taken for granted. 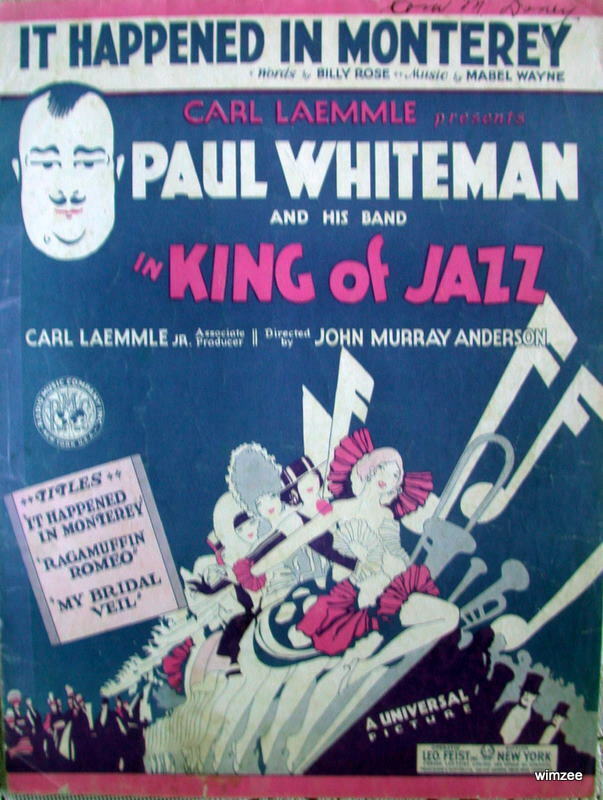 But he makes me think of the heroes of that instrument — Al Morgan, Wellman Braud, Steve Brown, Walter Page. And I always knew how marvelously Jeff Hamilton swung, having admired the two compact discs he’s recorded as a leader — check them out for yourself at http://www.jeffhamiltonjazz.com — but his playing at this session was especially rewarding. He can swing mightily in any tempo; his time is superb; he makes any drum kit sound orchestral without raising the volume; his solos have shape and form and wit. He surprises in the same way Dave Tough did, and his grounding in New Orleans jazz keeps any band rocking. I apologize to Jeff and to viewers for the post that seems to bisect him vertically. It didn’t seem to affect his playing, and filming from this angle kept me safe from airborne lindy-hoppers. The post’s title isn’t hyperbole. A friend sent me a few YouTube videos of this new band — holding forth on May 7, 2011, at the Bellingham Jazz Club (in Washington State). For a change, let’s begin with the rhythm section. You can barely see Candace Brown, but you can hear her firm, flexible pulse — she’s playing a Thirties National steel guitar. On her left is her husband Dave on string bass — strong yet fluid. Closer to the camera is that monument of unaging swing, Ray Skjelbred on piano — the hero of the steady, varied left-hand and the splashing, striding right hand. (His right hand knows what his left is doing: no worries!) The front line is a mere duo but with multiple personalities — great for Jimmie Noone / Doc Poston ecstasies — of two gifted multi-instrumentalists. On the left is Steve Wright — cornet, clarinet, soprano sax, vocal; to his right is Paul Woltz, bass, alto, soprano, tenor sax, and vocal. Their repertoire moves from New Orleans / ancient pop classics to Bix and Tram to Condonite romps with a special emphasis on Noone’s Apex Club. Now do you understand why I find these performances so enlivening? This band has tempo and swing, heart and soul, rhythm in its nursery rhymes! Seriously — what lovely rocking ocean-motion, heartfelt soloing and ensemble playing. This band knows and plays the verse and the tempos chosen are just right. And that beat! I want Ralph Peer or Tommy Rockwell to hear the RCBB and I want them to be under contract to Victor or OKeh right this minute! I would invite John Hammond to hear them, but John tends to meddle so – – – he’d want to replace half the band with people he liked better. And I can’t think of people I would prefer . . .
How about two more selections? By day and by profession, I am an academic — which explains the didactic streak in my character — but this is a suggestion aiming my readers towards happiness rather than a graded assignment. You might want to consider visiting Steve Wright’s YouTube channel — “swr2408018” and indulging yourself in the other performances by this band. 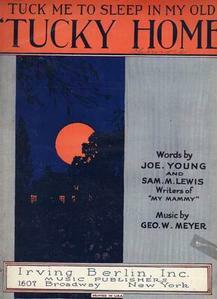 How about SWEET SUE, EVERY EVENING, KING JOE, ONE HOUR, STACK O’LEE, CHANGES MADE, GEORGIA CABIN, LET ME CALL YOU SWEETHEART, and I’M CRAZY ‘BOUT MY BABY. Now . . . suppose the names of these players are new to you? Ray Skjelbred has his own website — go there and feel good! — but Wright, Woltz, and the Browns might be less familiar to you. Don’t fret. Here are some facts for the factually-minded. DAVE BROWN began his musical career decades ago, on banjo and guitar, later expanding his impressive talents to string bass. He lays down solid rhythm with an energetic style influenced by Steve Brown and Pops Foster. Dave’s credits include membership in the Uptown Lowdown Jazz Band, Stumptown, Louisiana Joymakers, Chris Tyle’s Silver Leaf Jazz Band, Combo de Luxe, Glenn Crytzer’s Syncopators, Ray Skjelbred’s First Thursday Band, Gerry Green’s Crescent City Shakers and others. Many West Coast bands call Brown for gigs, including Simon Stribling’s New Orleans Ale Stars, Red Beans and Rice, Vancouver Classic, Solomon Douglas Sextet, and Jonathan Stout’s Campus Five. Over the years he has appeared at national and international jazz festivals and has been privileged to play alongside jazz greats “Doc” Cheatham, Spiegle Willcox, Jim Goodwin, and others. STEVE WRIGHT has been a sparkplug of many fine bands, including the Paramount Jazz of Boston, the Happy Feet Dance Orchestra, the Stomp Off “studio” band (The Back Bay Ramblers). He’s even substituted a few times with the Black Eagles on clarinet. After moving to Seattle in 1995, he joined the Evergreen Jazz Band as a second reed player and then moved to mostly playing cornet as personnel changed. In the last few years, he’s played a great deal with Candace’s and Ray’s bands, as well as with a local Lu Watters-style two-cornet band, Hume Street Jazz Band. 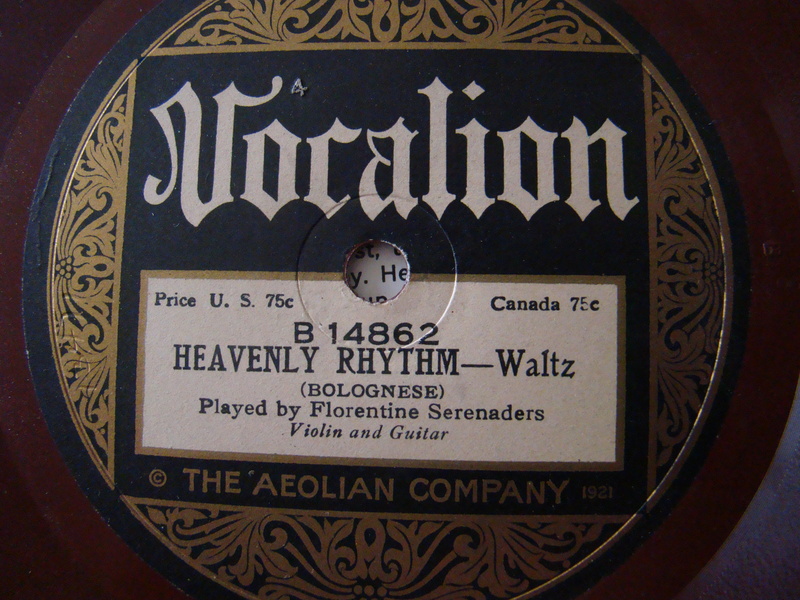 PAUL WOLTZ began playing music in his youth, in California. He performed frequently at Disneyland for a decade, worked as a studio musician in Hollywood, and was a member of the Golden Eagle Jazz Band. In the Seattle/Everett area, he is a member of the Uptown Lowdown Jazz Band (with whom he has performed at countless jazz festivals and on jazz cruises) is principal bassoonist in the Cascade Symphony, occasionally performs with the 5th Ave Theater, and is called as a sub in numerous bands in the Puget Sound area and beyond — all over the United States and abroad. They stay together, if you hadn’t noticed. Here’s more rollicking joy from Dixieland Monterey (the Jazz Bash by the Bay) that I attended in March 2011. This was a session held at the Wharf Theatre. It wasn’t billed as FAMILY REUNION, but it might as well have been. First, the Reynolds Brothers (and they are! ): John Reynolds on National steel guitar, vocals, and sweet whistling, and brother Ralf on washboard, whistle, emotional uplift, and traffic control. Then there’s the Caparone Family. Marc on cornet; his father Dave (the fellow over to the left of your screen, looking very serious, sounding like Benny Morton — in fact, sounding like Don Redman’s trombone section of 1932-3 with an occasional nod to Dicky Wells — a real prize! ), and daughter-in-law Dawn Lambeth (vocals, piano, and cheer). Observant eyes will catch that Dawn is about to become a Jazz Mommy (Marc had something to do with this, it was told to me) so there’s another generation of Caparone onstage. And baby does make three! The sole non-relative was the sweetly leafy Katie Cavera (string bass and vocals) . . . but everyone who meets Katie adopts her within the first few minutes, so she’s not an outsider. Jazz scholars will note so many wonderful influences floating through these performance: Bing, the QHCF, Louis, Basie, Steve Brown, Red Allen, Billie Holiday, Teddy Wilson, Bobby Hackett, Lee Wiley, the Marx Brothers, Brunswick Records, the Washboard Rhythm Kings, Steve Washington, and more. Time for something deeply satisfying in its sweetness: and watch everyone’s face as they feel the love on that stand, just as we do. What tenderness as Dawn, Dave, and Marc celebrate SUGAR! “Every day’s a holiday” with a band like this, for sure! While watching these videos, I keep thinking of Baby Lambeth-Caparone, who’s going to greet the new day at the end of March 2011. Someday that Baby is going to be able to see these clips and say, “There’s Mommy, and Daddy, and Grandpa, and I was there, too!” Yes, Baby — you were swinging with your families. I have to come out with it: the seventy-five minute span of a compact disc is often too much for me. 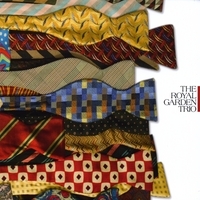 So when I loaded the first of three discs by the Royal Garden Trio into the car player, I expected the outcome to be the same: restlessness halfway through. No, the Beloved and I (she’s a stern critic herself) played the three discs nonstop during a six-hour drive. On these CDs, the RGT is made up of Mike Karoub (cello and string bass); Tom Bogardus (tenor guitar and clarinet), Brian Delaney (acoustic and electric 6-string guitars). 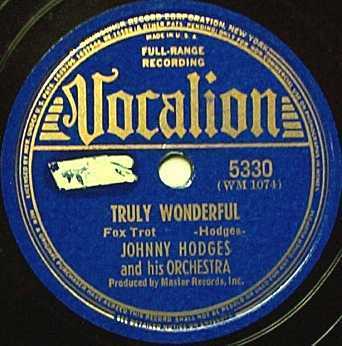 And they have eminent guest stars: Jon-Erik Kellso (trumpet); James Dapogny (piano); Bess Bonnier (piano, heard on JITTERBUG WALTZ below); Chris Smith (sousaphone), Louis Caponecchia (ukulele / vocal); Jo Serrapere, Paul King, Melissa Brady (vocals); Gian Paulo (string bass), Rod McDonald (guitar), Donn Deniston (drums). 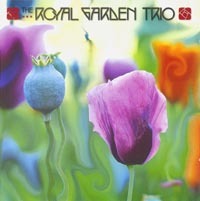 What makes the Royal Garden Trio so delightful is their own restrained eloquence. The world is full of enthusiastic Hot Club spinoffs — very capable musicians, inspired by Django and Stephane. But often the result is “note for note,” which is amazing technically but less so aesthetically, or an overabundance . 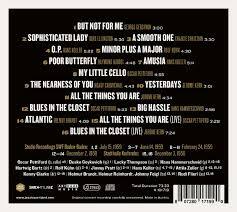 . . many notes, many choruses, fast tempos, dalling string virtuosity. One part of the brain admires; the other portion asks (in Lester Young’s words) to be told a story. The members of the RGT have beautiful stories to tell. They are virtuosic as well, but they know that too much is not a good thing. So their solos are thoughtful speech, not diatribes; their notes ring and resound in the air. Each player creates compelling melodies, and they work together like a swing version of the Budapest Quartet. Since I often find the heirs to Grappelli are given to excessive sweetness and high drama, I am thrilled by Karoub’s cello: earnest, dark yet lithe. Mike’s conception is never overblown, but his solos can be majestic. Delaney’s guitar is part Lang, part Lonnie Johnson. Bogardus romps on his guitar and his clarinet playing is easy, fervent, balancing Dodds and klezmer. And the trio works together to create something beautiful, varied, and cheering. Their performances are marvelous vignettes, the guitarists switching lead and rhythm, Bogardus playing a chorus on clarinet; Karoub bowing and then plucking in a propulsive manner (across bar lines) that recalls Steve Brown. And they swing — without even trying hard. Although much of the repertoire is familiar, the trio’s approach lifts it up: I never found myself saying, “Oh, another ST. LOUIS BLUES,” but was excited by what this band can do. And the CDs offer some less-played material as well: Ellington’s SATURDAY NIGHT FUNCTION, LOUISIANA FAIRY TALE (for the home-improvement minded among us, but this time with the verse), THERE’LL COME A TIME, RAGGIN’ THE SCALE, I’M FOREVER BLOWING BUBBLES, GO INTO YOUR DANCE, a hidden track of APRIL KISSES, and some winding originals that sound like theme music for mid-Thirties screwball comedy films. 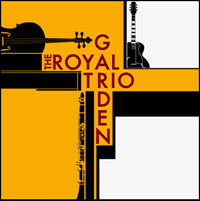 To find out more, visit the Trio’s website: http://www.theroyalgardentrio.com/sched.html. 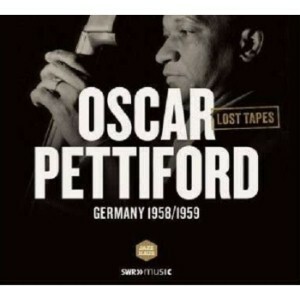 And if you feel moved to purchase all three discs (I recommend this) ask for the JAZZ LIVES discount. These players (and their nimble friends) will bring joy, in or out of the car.